Meet Gary the bear - he just can't stop chatting! 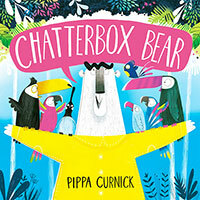 A laugh-out-loud-funny story about friendship and understanding.Meet Gary the bear - he just can't stop chatting! A laugh-out-loud-funny story about friendship and understanding. Meet Gary the bear - he just can't stop chatting! A laugh-out-loud-funny story about friendship and understanding. Gary the bear is a chatterbox, but when nobody wants to listen he sets sail in search of new friends. Soon Gary arrives on an island full of birds . . . the problem is they don't understand a word of Bear! Gary has to learn that words are not the only way to communicate and make new friends. This sunny and bright picture book is bursting with energy and humour. From the illustrator of LUCIE GOOSE, shortlisted for the Evening Standard Oscar's First Book Prize.